The difference between the energy absorbed by the earth’s surface from direct incoming solar radiation and the energy reradiating back to the space as reflected solar radiation from soil and leaf surfaces will contribute to “radiative forcing” and creates a typical “photothermal” environment in the atmosphere. This photothermal environment is gradually changing due to several anthropogenic and natural causes leading to increase in aerosols and other air pollutants coupled with frequent occurrence of extreme temperature events. This change in the photothermal environment is being manifested through decreased photosynthetically active radiation (PAR) received at earth’s surface by more than 6% and nearly doubling in the rate of increase in atmospheric temperature in the last 50 years. Consequently, crops’ response to fluctuations in the magnitude and distribution of these two weather elements, i.e., light/radiation and temperature play an important role in determining its growth and development. Besides, response of the crops to these extremes also depends on the genetic constitution, physiological make-up (C3, C4, and CAM plants; light sensitivity) and stages of growth of different crop species. Therefore, in view of the above facts, the target to improve crop productivity to cater the demand of ever-growing population can only be achieved by taking adaptation measures through various management interventions including manipulating the photothermal environment. 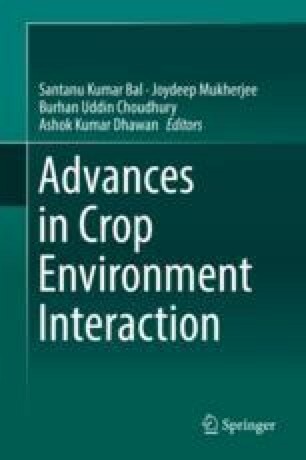 This chapter describes the aspects of solar radiation, radiative forcing, low and high temperatures, photothermal quotient, etc., which have direct and indirect impacts on crop production and also the possible photothermal-related management strategies for enhancing crop productivity.